A little vanity here, but it is exciting to be involved in projects beyond TheChaplainKit.com! Here are the stories of media productions, publications and ministries much larger than this website that TheChaplainKit.com has had a part in (even minimally). Trinity Broadcasting Network airs a show called “America’s Hidden History” which is hosted by Wallbuilders with David Barton and his son Tim Barton. 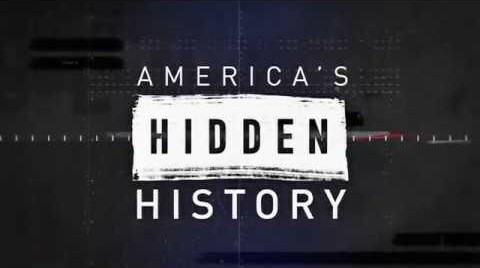 In March 2018, Wallbuilders put out a call for Veterans, Veteran families and Gold Star families to attend the taping of an episode of America’s Hidden History which would be aired on TBN on Memorial Day. 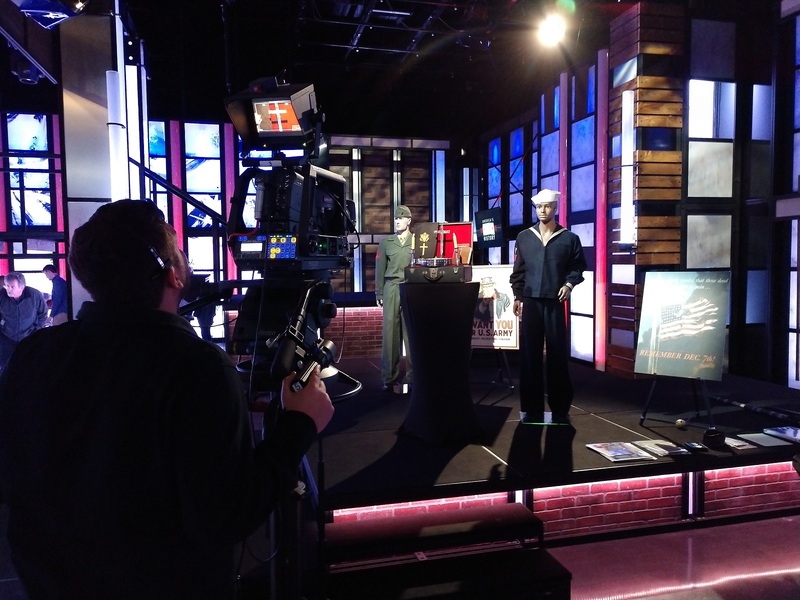 The show was going to focus on the military and feature survivors as well as stories of others who gave their lives during their military service. The announcement also said that there would be military artifacts on display from throughout our nation’s history. I contacted them to get a seat in the audience and also asked if they would be interested in one of my chaplain kits for their artifacts display. I received a reply that David Barton was interested in one of my WW2 chaplain kits for the show…so I made plans to attend and bring my kit. At the taping, the live guest was LTC (Ret.) Brian Birdwell (now a Texas state Senator), who was the survivor closest to the impact site at the Pentagon on 9/11. Among other heroic acts shared, the story of the Four Chaplains was also told. At the conclusion of the live taping, Micah, the producer had me set up my kit and it was filmed for insertion into the program during editing. As it turned out, my chaplain kit didn’t make the final cut, but it was still great to be able to share it with others and be there for the taping of the program. 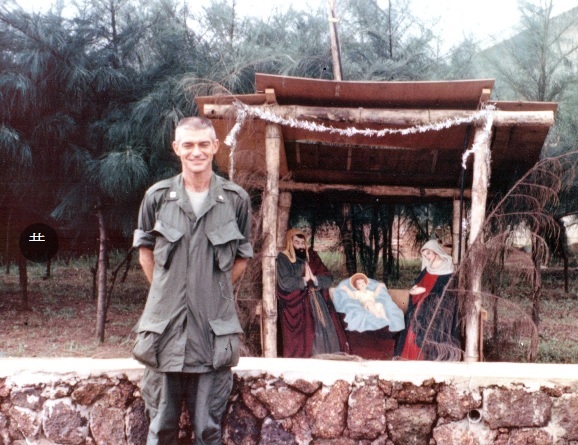 Chaplain Capodanno on Christmas Day, 1966 (capodannoguild.org). Toward in the end of May 2017, I received a call at my office. On the other line was James Kelty, a producer who was working on a project for the Father Capodanno Guild entitled Called and Chosen. He explained a little bit about the project and the goal of the Guild to encourage the eventual declaration of sainthood of Father Capodanno then began to ask about chaplain kits used in Vietnam. Mr. Kelty explained that the goal was for the film to air on the Eternal Word Television Network (EWTN) on the 50th anniversary of Chaplain Capodanno’s death, 4 September 2017. I explained to him what I knew about Vietnam-era chaplain kits and what I had in my collection. 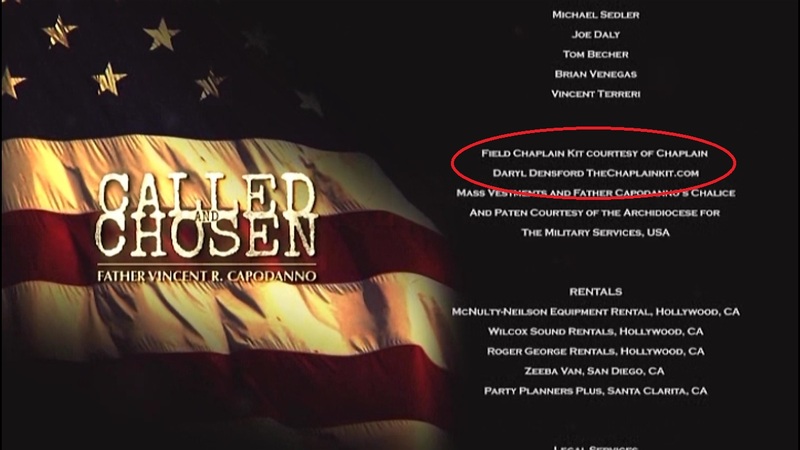 For a few days after our phone conversation, I continued researching the type of chaplain kit Chaplain Capodanno may have used, including contacting Chaplain Mode, a Navy chaplain who wrote the book “Grunt Padre” which the film is partially based on. I had some information shared with me by the producer from Chaplain Capodanno’s chaplain assistant in Vietnam but there was little other information or pictures available that could give much of a clue. I continued to research it, contacting an Army chaplain friend of mine who is a massive chaplain militaria collector and historian. He had a lot of great information to give me including what Marine chaplains likely used while in the field in Vietnam. 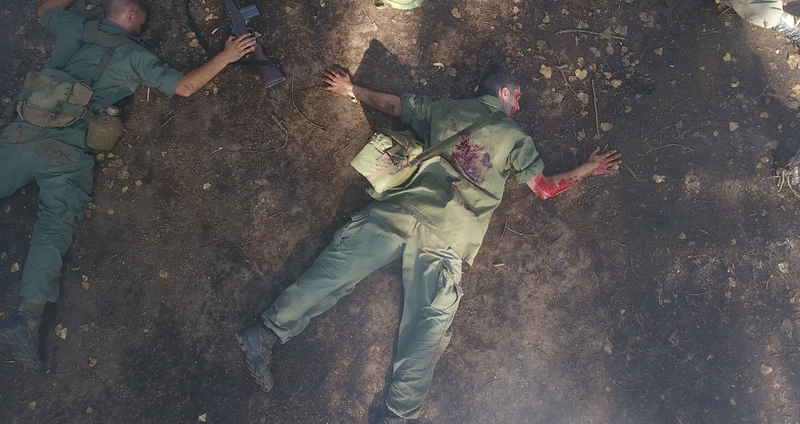 Pre-release screen shot from “Called & Chosen” (courtesy of James Kelty). After sharing what I found out with the producer and talking over the visual aspects of the scene, it was decided that I would send him my Vietnam-era Catholic chaplain kit that was primarily used by Army chaplains, but sometimes by Marine chaplains in Vietnam. The elements included in the kit, the size and portability of the case and the visual appeal all contributed to make it the best choice. So I sent it to him FedEx overnight, with it expected to arrive just two days before they were scheduled to fly out for shooting the first weekend of June. You can see more pictures from the filming of Called and Chosen on Flicker. 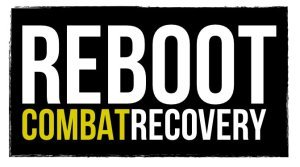 In November 2016 while I was in Washington D.C. attending an Army course, I received an e-mail from Amanda Bonavita of Turquoise Films. She is the producer of GI Jews, a film being developed about American Jews’ involvement in World War II which will be released on national public television with teachers guides being distributed through the PBS Learning Library. Ms. Bonavita had seen several pictures on TheChaplainKit.com that she had questions about and inquired about other information that I had on Jewish chaplain participation in WW2. I gave her information on the pictures she asked about, and shared with her more that I had in my files that I hadn’t yet posted, and other information pertaining to Jewish chaplains and their training in World War II. 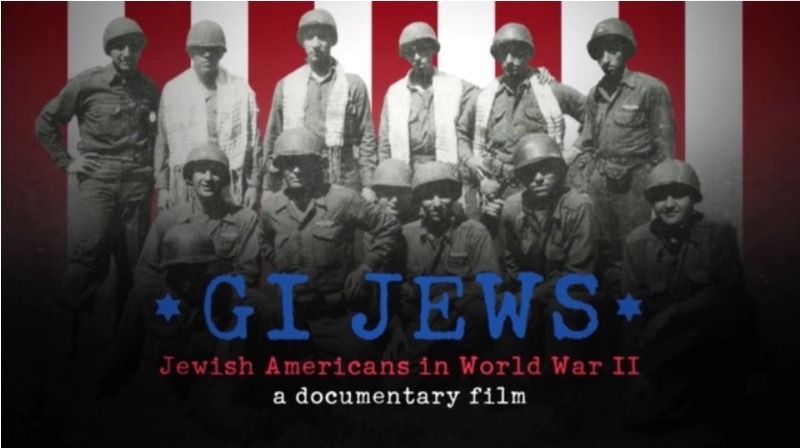 I had very minimal involvement in GI Jews but it was exciting to be involved, even a little, in a film that will include chaplains’ ministry in war. I was contacted late summer 2017 from someone at SFTS and asked if I would be willing to be interviewed to get information about a couple of World War II era chaplain kits that they had “rediscovered” in the seminary archives. Of course I responded affirmatively and was later contacted by the article’s author. I was able to offer some information about the kits that the seminary had donated to them and even found information about one of the chaplains who used one of them during the war and went on to write at least one of the Navy Chaplain Corps official histories. I had the opportunity to read a near-final draft of the article, where the author quoted me but when the Winter 2017/2018 issue was finally published, I discovered that they even referred readers to TheChaplainKit.com to explore more information about the history of military chaplaincy! Below is the page from the magazine with the article, but you can see the whole issue (plus many previous issues) at the Chimes magazine page of the SFTS website. Operation Heal Our Patriots (OHOP) is a ministry of Samaritan’s Purse, that brings wounded warriors to a retreat in Alaska and continues to minister to them following the retreat through OHOP “alumni” gatherings and other pastoral contacts helping them to heal from their emotional and spiritual wounds from combat. 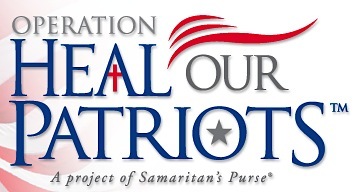 I was contacted by the OHOP chaplain, a retired Navy chaplain, to see if I had any chaplain kits for sale. He said that he had been carrying his back and forth to Alaska and it was getting pretty worn. They were looking for a military chaplain kit, since that would be something the Service Members attending would be used to seeing. I sent pictures of a couple that I had available and of another one for sale by someone known to me. Being a ministry, they were cautious with their expectations, wanting to be good stewards of the money that their donors contribute, realizing that some give sacrificially to their ministry. 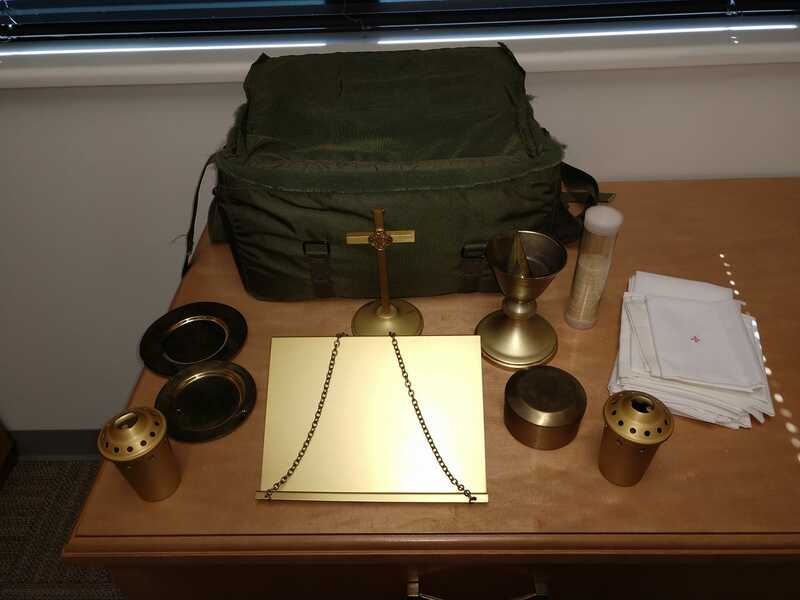 After discussing more of what they were looking for and how it would be used, I decided to donate a surplus Vietnam-era chaplain kit that I had been preparing to sell. 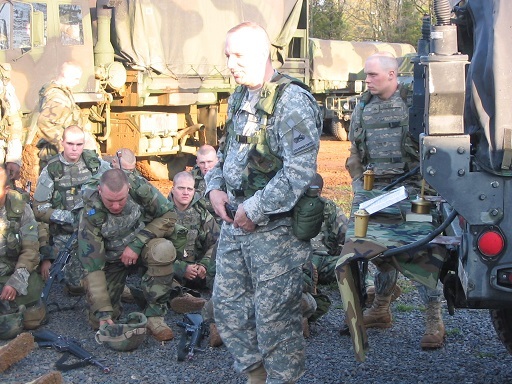 It was a kit that I bought from a chaplain who was getting out of the Army National Guard just as I was coming in. I had used it early on in my chaplaincy, so it had been used over the years by several chaplains in ministry to Soldiers. Now, this chaplain kit will remain onsite at the OHOP retreat center in Alaska and be used by OHOP chaplains to provide worship and the Lord’s Supper to wounded warriors and their spouses while on retreat with OHOP, as they seek healing and wholeness in God. What better use could there be for it?